Brett Bohlmann, along with his wife, is the owner of HWY 7 Service Center, Newell, IA. He began his career in the automotive industry as an automotive technician. Over the years, Brett began to acquire top notch experience and a love of automobiles but more of a passion for learning in the entire automotive industry. In 2010, Brett had an urge to start and open Hwy 7 Service Center with the goal of always exceeding the customer’s expectations. Oil definitely pumps in his veins as automotive knowledge, skill, and work ethic radiate from his actions and words. However, the fuel for the fire comes from his family at home and the community that has become a large family too. Find out more about Brett’s episodes HERE. He decided to build his people. Make then enthusiastic. He conquered because he put people first. Andrew Carnegie had 30 millionaires working for him. People need to work for more than a job. What about significance? We need to get out of our comfort zones and to start to lead our people. Invest in them for the long term. We can’t let our condition to control our attitude. We must let our attitude control our conditions. You build your people and they build the business. 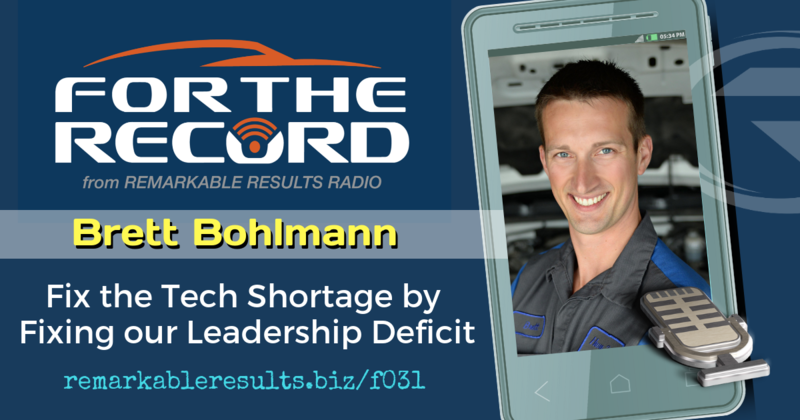 A special thanks to Brett Bohlmann for sharing his passion – For The Record.